Division One side Drayton FC Res almost pulled off a shock win over Poplar Athletic FC in the final of the Graham Beal Memorial Observer Shield, but eventually lost out on penalties to the Premier One outfit. Drayton took the lead after 22 minutes through Lee Wallace but Poplar came close to levelling the scores when Danny Taylor saw his header hit the bar. 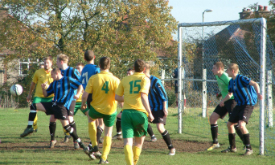 Poplar were then awarded a penalty that Man of the Match Joe Salisbury saved in the Drayton goal. After the break Poplar were awarded another penalty but despite changing the penalty taker, Salisbury produced a great save to keep the ball out. Almost immediately Drayton went down the other end with Lewis Collins finishing of a flowing move to make it 2-0 and the game looked won. However Poplar then found their rhythm and Joe Miles and Danny Taylor right on the stroke of full time, drew the scores level. 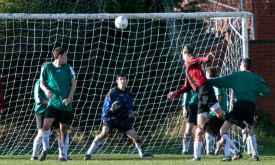 Both keepers made fine saves in the shoot-out, but three saves by Poplar keeper Danny Hollywood ensured they won 3-2.